Successfully Added 802.11N Wireless Router (300Mbps Wifi - Next Generation Speed) to your Shopping Cart. Next generation 802.11N wireless router using the latest WiFi protocol, and supporting data transfer speeds of up to 300Mbps. Use the CVNK-K53 for surfing the internet at 5x the speed you experienced previously! What makes this wireless router special? We are glad you asked! This 802.11n wireless router is special because of the "N" in the 802.11n. Previous WiFi data transfer rate depended on the 802.11b and/or 802.11g. Although this wireless router supports both previous standards that are still being used today, it also supports the latest protocol of 802.11n. That means, instead of being limited to the 54 mbps data transfer rate you have now with the "G" standard, you now have 300 mbps of data transfer, offering you 5 times the speed you have now. Can you imagine surfing the net 5x as fast as you do now?!?! Man, that is living! For those of you who still like your wired internet connections, this router has 4 Ethernet LAN ports, which means you can connect this router to 4 separate computers via wired connections as well as having the ability to connect to it wirelessly. The 300Mbps 802.11N wireless router is in stock now and available for single and bulk purchases, Click "Add to Cart" now, and we'll ship you a sample the very next day. The CVNK-K53 300Mbps wireless router is brought to you from the leaders in China factory direct wholesale electronics, Chinavasion. Use the Advanced Setup page to make detailed settings for the Wireless network. Advanced Setup includes items that are not available from the Basic Setup page, such as Beacon Interval, Control Tx Rates and Basic Data Rates. What does the IEEE 802.11N mean for internet users? Well, the 802.11N is an amendment to the IEEE 802.11b/g wireless networking standard which improves the network over previous standards, such as 802.11b and 802.11g. It does so by significantly increasing the maximum raw data rate from 54 Mbit/s to a maximum of 300 Mbit/s. I have lost my user manual, what is the default username and password? The default user name is Admin, and the Password is also Admin. What does Mbps actually mean? Does this wireless router support dynamic routing? Yes, You may add and remote custom Internet routing rules, and/or enable dynamic routing exchange protocol with this wireless router. QoS stands for, Quality of Service. You may setup rules to provide Quality of Service guarantees for specific applications, in the QoS configuration window. What does Mesh Network mean? A Mesh Network is an IEEE 802 LAN comprised of IEEE 802.11 links and control elements to forward frames among the network members. I was able to find compatible firmware. Is it okay to "flash the firmware" for this product? Please refrain from flashing the firmware as it negates your product warranty. Good product, from a reliable store!!!!! N-class router (switch) for under $30 brilliant. Once set up for English I was amazed at the amount of options it has. LAN, WAN, Bridge only, repeater only, firewall configurability, configurable QoS, anything I can imagine. I did have a few problems setting it up and when I factory reset it would go back to Chinese but I guessed the buttons to press and it works. It has better Wifi range than my top of the line Billion-DSL-Modem at a tenth the cost. Even with postage, this is probably the most consistently cheapest Chinese Electronics website I have seen. 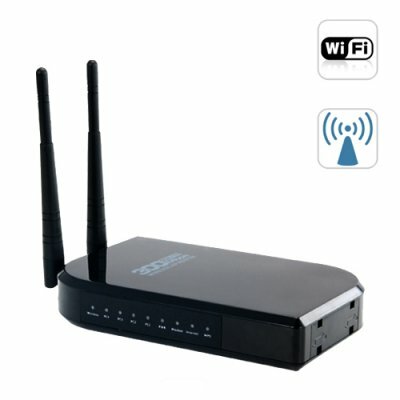 on 2010-10-13 20:25:05 Ottimo Router Wireless!!! Excellent Wireless Router!!! Ottimo Access Point Router Wireless, velocissimo nella connessione e l'interfaccia è molto semplice da configurare!!! Grande Chinavasion!!! Excellent Wireless Router!!! Very fast and the web interface is very easy to configure!!! Great Chinavasion!!! on 2010-07-08 15:11:24 Nice product and with super fast delivery! received the goods within 3 days after ordering this on the website....way to go chinavasion! fully compatable with acorp WR-NL RT3050 formware.